Hi Everyone, welcome back! If you’re new, thank you for checking us out! Unfortunately this episode, Katy has come down with a nasty bit of Bronchitis, so you get Val all to yourselves! First off, we have a couple people that need a big THANK YOU!!! Thank you to Tiffany of the Knitting at Tiffany’s Podcast for sending us a really pretty card thanking us for the awesome Canon Hand Dyes prize in our Round 3 of Downton Abbey Trivia! Thank you to Angie (crouchingcheese) for sending both Val and Katy the ‘Handbrake’ Pattern by Dan & Kay Jones from the Bakery Bears Podcast! 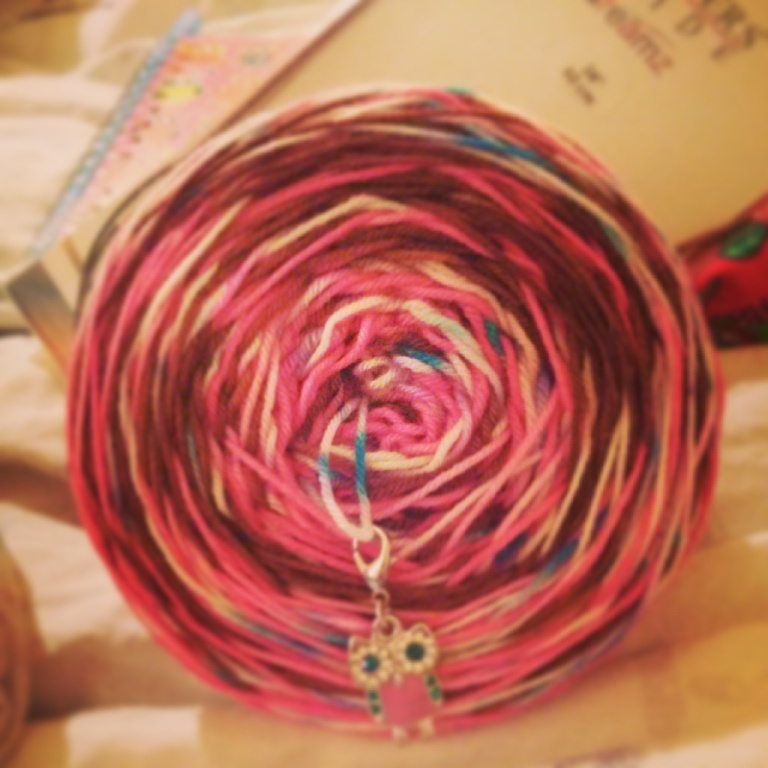 It’s 1 pound per pattern and all proceeds go to cancer research, so pass it on!!! It’s a great pattern. Katy gifted it to her mom after Angie had sent it to her. Also, Shannon of the Minerva Turkey Podcast lost her little hedgehog, Sheriff Woody, very suddenly. Our hearts go out to you and warm, healing hugs. Valerie and Katy both know what it’s like to lose a cherished, loved animal so we empathise with everyone greatly. If you’re listening right on April 30th, we’d like to remind you to hurry and enter our contest!!! 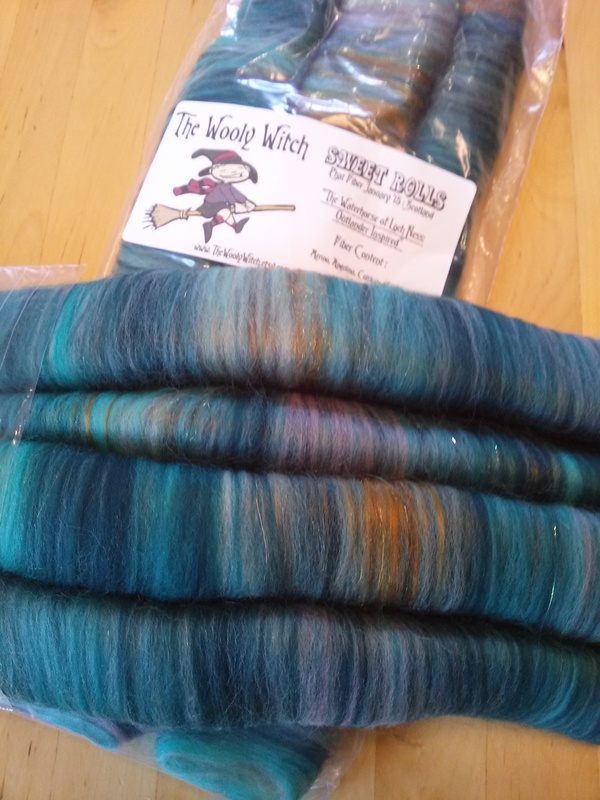 We had a very generous donation of a lovely prize from The Wooly Witch!!! She sent us 2 ounces of her ‘Sweet Rolls’ spinning rolags in the colourway ‘The Waterhorse of Loch Ness’! Now in celebration of the return of ‘Outlander’ to television (April 4th in the States and April 5th in Canada) we are giving these 2 ounces of spinning rolags to one lucky listener. All you have to do is head over to our Ravelry group, and take a look at the Wooly Witch’s etsy shop and tell us what your favourite colourway is and what you would make with it! You must be a member of our Ravelry group to win these gorgeous rolags. We hope everyone who went to the Knitter’s Frolic had an awesome time and scored some sweet swag! Even though Katy is sick, she still managed to get a HO off the needles! 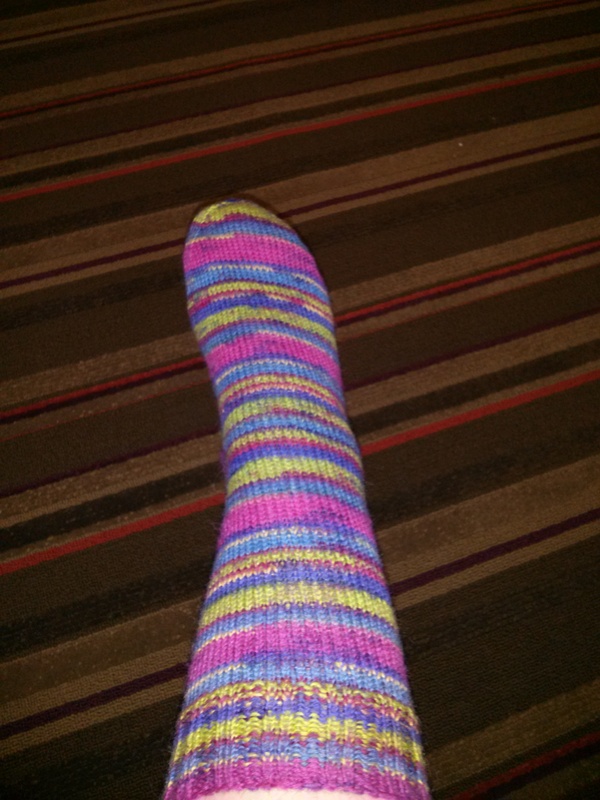 It’s the Red Heart, Heart & Sole ‘Spring Stripes’ yarn that Val had bought her for her birthday present! Thank you every one for tuning in and we’ll be back in full force for our May 15, 2015 episode. Take Care! « Episode 21 – David Suzuki is a Troll!